If the Polar Vortex is due to Global Warming, Why are U.S. Cold Waves Decreasing? | Watts Up With That? January 31st, 2019 by Roy W. Spencer, Ph. D.
That one’s easy: Because of “Global Warming”, silly. Or is it “climate change”? Hard to keep up with the narrative. I think the operative word there is “millenials”, i.e. it is the noisy, (anti)social media connected, real world head up their arses millenials who are the target market for all thes CAGW/CC drivel. It is straight out of the Goebbel’s propaganda playbook. What amazes me is that so many seemed to be bamboozled and unable to see that everything is Global Warming or da, da, da, daaaa Climate Change. And then I realize for the past two generations the public school systems and our institutions of Hgher Indoctrination have been very successful at the mission of fooling most of the people all of the time. Of course they have been supported by the Primary Media outlets and Hollywood so it comes as no real suprise. We have a new generation where a majority believes the climate never changed around the world before the burning of fossil fuel and that socialism has never failed anywhere it has been practically applied. They will need to suffer before they will understand how badly they have been lied to. Take away electricity every time they flip a light switch and let them listen to their growling stomachs while shivering in the dark and they will finally understand. Unfortunately by then it will take a revolution to unseat the dictators and massive bureaucracy (aka swamp people) who peddled these lies. Notice that climate disruption fell from vogue? Glad to see the back of Climate Weirding even though a huge own goal. It can also do the opposite if you want, waddayou want? More? Less? what? Getcha’s explinations over heres. Cheap! It is utterly outrageous that Dr. Spencer is actually using observational data to disprove the assertions of climate alarmists. Doesn’t he realise that this will hurt their feelings? The climate communicators have it covered. Dr Spencer’s data don’t have a chance. Think of the Jet Stream as a full-support bra for the Polar Vortex. Now think of global warming as a clothes dryer. We dried that bra on “hot” too many times and destroyed all the supportive elastic…. …this is why you get Loose Boobies of Deathly Cold. I picked that up on Eric Holthaus’ twitter feed, btw. He’s a meteorologist, yano. Really on top of his game. He’s a full blown nutbar. Fits right in with the AGW crowd. I think in another time and place he would have been the village idiot. I think I am gonna go onto my twittermachine and tell ms. girlyratfish the obvious: Loose boobies, whether the deathly cold variety, or of the tippy-top of the great warmy-warmy sort, are more properly ascribable to a theory which is reaching old age. It is even worse when stretch marks, from being badly contorted into every possible extreme shape for so many years, mar the surface of the appendages in question. It has been rather conclusively demonstrated that bras, most eckspeshally the full support ones, may give the illusion of preventing sag and other forms of looseness, but that actually they do the opposite, and going braless keeps boobies far more resiliently firm and highly placed in their proper domain, which is of course high up on the chest and pointing ever skyward towards the real villain. It is a third wave feminazi lie that men cause all problems on the Earth. In fact, only a lifetime of proper male attention can save the boobies, although it is sadly too late for some, many can even yet be saved from the sad fate of looseness. It is the Sun, dammit…the Sun. We must spread the word, before it is too late! Burn a bra, and save them boobies! Speaking of misleading terms, why to we refer to the beauty of breasts as ‘boobies’? When they make their appearance, does anyone boo? Maybe a boo-hoo when this items of affection are out of reach. No, the sight of beautiful breasts usually brings out cheers. Therefore, I submit we change this misleading term to Yaybies! If the AGW can corrupt ideas, we can at least improve on one. Yes, he will never get a job at Buzzfeed, Vice, Yahoo, or any one of the other million or so clickbait factories posing as journalism. Let alone on CNNCBSABCNBCNPRPBS, etc. Then again, luckily for us, neither will all those recent liberal arts grads who write for free but have wonderfully inaccurate titles such as “Senior Science Correspondent” or “Senior Science Editor”. I believe most of the reduction in Arctic Ice is due to the Gulf Stream getting stronger and pushing much farther NorthEast through the Barents Sea to Yuzhny Island. The Canadian Arctic has had its ups and downs, but is basically not trending very much. See http://polar.ncep.noaa.gov/sst/ophi/color_anomaly_NPS_ophi0.png for example. Gotta be careful. You can prove anything you want by selecting the range of data that shows what you want. Drs. Christy and Spencer used the whole range of relatively reliable data available, ie since 1895. To me, that looks pretty careful. The data from AD 1770 to 1894 just aren’t fit for purpose in most places. It goes back to 1895 – are you suggesting that if you go back further it will show something different? From the El Niño year1998 until now, the positive correlation is, what’s that word…..”unequivocal”…. To detect changes in trends you have to select various ranges of data. Another possible explanation (and one that is equally plausible) is that global warming does in fact disrupt the polar vortex, but in doing so, it increases global cooling which thus counteracts the effect of global warming. This is a negative feedback or damping phenomenon which would explain the relative stability of our climate. I think what you are really saying is that more legitimate science needs to be done to study and try to explain the observed climate patterns. Unfortunately, in today’s world, the scientific method is going extinct. I’m not sure that is possible. This is “cold” moved elsewhere, not “new cold”. This isn’t even “cold” as in “absence of heat”. This is cold caused by heat! Far out, eh? As long as the “messaging language” keeps morphing to fit the FAILURES of Global Warming … we will be facing an “existential threat”. Exactly right, but for the wrong reason. The slow build up of average global temperatures over a century wasn’t scaring anybody much to do anything much, because we are short-term creatures. So a new narrative was needed, one that would scare us into immediate action. “Extreme weather” was the solution, something that is happening NOW! This is all about moving the threat from sometime well into the future to the present. I accept your friendly Amendment to my statement. The threat may never materialize. Judging from past climate models I put a high probability on it. Does anyone else see what I see? If you where to engage in the infamous curve fitting, it looks like the graph would be an inverted temperature graph. …. decreasing from 1895 to around 1950, then increasing to around 1980, then decreasing again till about 2005 ……. and …. ummm … looks like it is increasing again in the last 13 years again. I’m going to predict that it is going to continue to increase for the next 15-20 years. Would love if one of you data, curve fitting, brighter than me types would graph that out. What I see is that there are periods of low instance of polar outbreaks, and periods of higher frequency of them. These periods of time can be short or long. And throughout the record, we can see years of very high incidence directly adjacent to years of very low incidence. And sometimes we can see a year with high incidence sandwiched between two years of low incidence. It looks random to me, with some periods in one mode and others in another mode and some periods that are just scattered. If we look at the history of such things as the citrus fruit industry in Florida, for as long as there has been organized agriculture in Florida, and in particular a citrus industry, there have been long periods of time with no freezes, and in those periods people planted citrus further and further north. And then there was a catastrophic freeze caused by a polar outbreak extending all the way deep into the peninsula. When I moved to Central Florida in 1982, there were decades old citrus groves all across central Florida. The areas adjacent to SR 59 west of Orlando, all along the Highland Ridge. Amazing huge groves of giant trees that had to have pathways carved into them to allow access for spraying and harvesting, and to allow sun to penetrate. The trees were topped to keep the fruit from being out of reach. A series of freezes killed them all in the 1980s. These groves had survived many hard freezes in the 1970s, but had died anyway. There were a lot of freezes in those years, and a few in particular were unusual in that it was very cold AND very windy, for an extended period of time, lasting days. This prevented saving the trees using the methods that had worked in equally cold weather in previous events: Spraying with water. Simply put, it was too windy to coat the trees evenly with a layer of protective ice. There were other factors, such as a prohibition on using fires made from old tires and such, but with the wind these would likely have been ineffective anyway. But this event was only unique in that it was in our lifetime, and people have short memories. Or they think that history will not repeat itself. If you live in Florida your whole life and never see a outbreak severe enough to kill trees no matter what you do, you might think it cannot happen. But it does, as it always has. In the 1890s there was a severe freeze that ended agriculture in Florida for many people, industries, and crops, and for a long time. But then people forgot. By the time the series of hurricanes in the 1920s and 1930s hit, there was once again a huge citrus industry that was wiped out, or nearly so, and many areas, including some spared by the 1890s events. Looking back, it has been the case that decades of low or no instance of severe killing freezes have alternated with catastrophic events. The difference is, back then no one tried to say weather was because of people. They were known to be acts of God. Sorry, that should say SR 50 west of Orlando. If what Dr. Holdren said was true, we should have been seeing cold snaps like this more frequently over the last thirty years. We haven’t, we’ve seen less, Dr. Holdren was wrong. Read Dr. Holdren’s 1972 book about energy. No one was ever more wrong. Falsification only requires proof of source bias. Averaging data over distance without verifying reliability AND ACCURACY of the involved stations is source-biasing. Averaging data over distance? Try thinking maybe? It’s pretty simple to understand what Christie did, he took the average number of times that these official weather station dropped below the 5th percentile temperature for two days (filtering outliers) during a single winter and plotted that for each year going back to 1895. Without verifying reliability and accuracy? These are official weather data. Verifying reliability and accuracy does not mean adjusting data to match preconceived conclusions. And as it’s the same official data that the alarmist use to support the CAGW scare, if “not verifying reliability AND ACCURACY” is the what Prjindigo claims in order to”falsify” Christie’s work here, we’ll he’s also falsified the entire alarmist narrative at the same time. well done you, Prjindigo? – it can explain anything. However, it can forecast nothing. It is interesting that if you consider all the predictions by alarmists you will find them mostly wrong. Predictions made with some knowledge of the subject should prove correct more often than not. Logic therefore explains that propaganda or bias is driving the predictions. Or perhaps it could be their knowledge of the subject is lacking. The 1930’s, notable mostly or very hot summers seems to also been a period of very cold winters. Could that be due to very dry air throughout these years with insufficient water vapor to reject enough of the sun’s heat in summer and insufficient water vapor to retain the surface warmth during the winter? Like Tony Heller, I want to see that chart plotted back to at least 1960 because I suspect the period ’60-’79 was a mirror of the ’79-’98 years. Now that the Arctic sea ice is stable, is the frequency of excursions also stable? The least you can do is calculate the R square value for your linear regression analysis. You have a huge amount of variation. My guess is the R square value is way below 0.5 and you cannot claim anything. Easy for you to prove me wrong! Arctic sea ice summer minimum extent has been growing since its post-1979 record low in 2012, and flat since 2007. The low years of 2007, 2012 and 2016 each suffered August cyclones, with two in 2016. The winds spread out the floes and pile them up, reducing area covered by at least 15% ice. I’ve been looking at these events on and off for about dozen years, during that period I have registered notable polar vortex events January 2009, January 2014 and this January of 2019. The five years separation may be a coincidence since I don’t know of any similar period related to climate. There is of course el Nino , but it varies, it was many months ago and can’t see a direct connection. Hi MG, you are absolutely correct, but of course any new idea is automatically dismissed by ‘know it all excepts’. – polar vortex is electrically charged by cosmic rays or solar activity particles. In either case polar vortex is strongly ionised, and rotating at high velocity in presence of bifurcated magnetic field. Basic laws of physics imply splitting of vortex following the “lines” of magnetic field intensity. Spreading out end eventually split vartex looses its strength, consequently it’s hold on jet stream is weakest allowing it to buckle and loop southward. Locations of two magnetic peaks in N. Canada and central Siberia locks jet stream in fixed position talking warm Pacific air to Alaska and cold Arctic air to N. America and Europe. Provide the satellite measurements of Arctic sea ice first. And global temperature; remember you can’t rely on the much modified thermometer measurements because they don’t even cover the whole globe. The chart I see goes back to 1895. Skeptics can point to decreasing spans of cold, when we want to defeat claims of global warming, and alarmists can point to decreasing spans of cold to support claims of global warming. 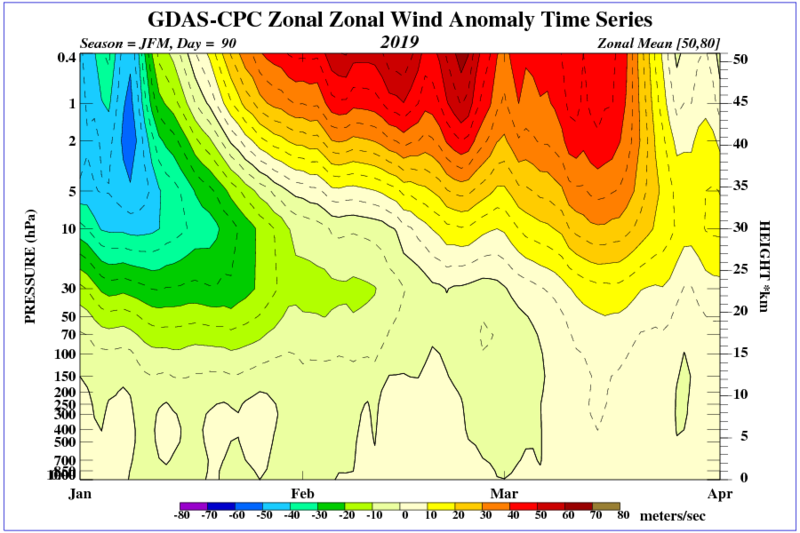 Often during SSW- sudden stratospheric warming polar vortex spreads out and eventually splits-up into two independent vorteces which, for as yet fully unexplained reason, end up above the two locations of strongest magnetic field in the North Hemisphere. – Earth’s rotation axis has irregular oscillation i.e. the longer term Chandler’s wabble that might be responsible for both. I tend to favour the first, but if anyone might have another explanation it would be welcome. It is important to know that rise in the Siberian leg of the field has been prominent in the last 100+ years, while the Canadian has been loosing strength at the same time, the crossover point was around 1995-6. No, the reason is meteorological/topographical. The two vortices are attracted to each of the two major land masses … and that generate cold over snowfield in winter. The radiating surfaces are constantly cooling any advected airmass. They will not end up over either the N Atlantic and the N Pacific for that reason. The Rockies preferentially bend the PJS south to its lee into Canada due to conservation of total vorticity upon a westerly flowing over it…..
Centre of continental mas is not at the Hudson bay but much further south, but as it happens the Hudson bay area is one of two centres of strongest magnetic field in the N. Hemisphere, the other being in central Siberia. 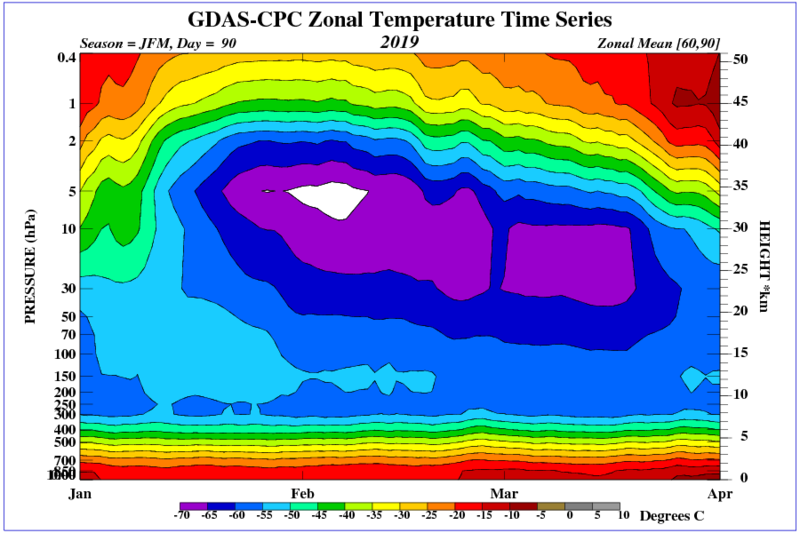 Continental masses are there every winter, but the polar vortex gets maximum ionisation following the time of solar maxima (solar radiation) or the time of solar minima (cosmic radiation), i.e about every five years resulting in the cold snaps of 2004, 2009, 2014, 2019. Perhaps you might do well to consider alternative way of looking at physics of the matter. See my reply to Matt G further above. Vuk I think the only reason were here, is because of the processes from inside Earth itself ,generating electricity and then magnetism. “Together, these signals form the magnetic field that protects us from cosmic radiation and charged particles that stream towards Earth in solar winds. Climate science has become ad hoc storytelling. You mean like the Aesop’s fables for children, at least those have morality lessons. Exactly, fables. Used for political expediency rather than moral instruction. The most entertaining part of the climate consensus is that it’s promoters perform world class post hoc arm waving so frequently. Was it just me, or did you notice that arm waving take on a feverish pitch after the severe 12-year hurricane hiatus, the 18-year warming hiatus and expired fulfillment dates on a number of their false prophecies? Unfortunately, those who understand math and science aren’t as good at this as the alarmists. As I’ve said: unless its an evacutation order, you can usually ignore both the loud end of the megaphone, and the small mind at the other end of it. It is very easy to troll warmistas, but few who are actually informed, and given to the pursuit of knowledge, are much interested in being the source of misinformation. Also, there are many ways to be wrong about some thing or anything. But a much smaller target when it comes to being right. This is a bit off topic but relates to falsified information re: climate change and insurance issues. It was just published today. Could this story be true? If so, what will the ramifications be? It doesn’t stop the BS train from rolling down the we ain’t thinking tracks. If there are more cold waves…it’s global warming. If there are less cold waves… it’s global warming. When a theory is “consistent” with every possible outcome it is not falsifiable. Therefor it is not science. Yes, here in Toronto, models were used to show that both more spring runoff, and less spring runoff were the “new normals”. Years apart, of course. And the period in between was ignored for some reason, being normal. Luckily for Big Green, they can rely on people a) trying to do the right thing (with as little effort as possible), and b) having short memories (and little to no science or math). And it helps the greens that the compliant news media never calls them out on past predictions that never happened and are inconsistent with the new predictions. Quick look at the data and my takeaway is a multi-decadal pattern. There is a higher than average period in the early 1900s, a slow decline to a lower than average period in the 1930-1950s and then a rise into the, 1980s, and a decline into the 2000s. There could be a current rising trend, although the data is limited to make that determination. Anyone (Calling Bob Tisdale) want to correlate this activity with longer term ocean temperature trends? My theory here (more a guess) is that this will correlate nicely with trends in PDO, AMO or basin temp trends – which no one should be surprised with. I have no idea if a warm Pacific and a cold ATL may open the door for the Polar Vortex to be more easily displaced, whether a particular ocean pattern may be more conducive to SSW in the winter months, etc. But that is what science and data and analysis is supposed to identify. The fact that so many ignorant elected officials, wannabe elected officials, and even bureaucrats at places like NOAA are even hinting that cold outbreaks are due to anthropogenic activity is silly on its face. A little analysis may show how silly. I agree that the idea that oceans influence the atmosphere more than vice-versa. I would predict the Pacific and Atlantic ocean temp anomaly would match the waves graph above showing top US 5% cold waves, and I would also predict a nice match for a graph US temps vs ocean sea temp anomaly. Those would be nice graphs to compare vs CO2 levels. A better question would be if nothing cannot be attributed to AGW, what does it actual mean ? For can something which is ‘everything ‘ have real meaning for to have a meaning you must have boundaries of some from to know what you are and are not . Of course this event was going to be jumped as ‘proof ‘ of climate doom , so both hot and cold events have been before while the claim ‘weather is not climate ‘ as long been forgotten. And the reason for that , because it was be noted that doom ,of the type that was claimed to arrive soon, simply was not as tipping points and countdowns run their course. So when reality failed to supply they had to resort to grapping anything they could to be the train in track. And this action was required not because of the strength of their ‘settled science ‘ but because of the weakness in their actual science. That guess work and ‘better than nothing ‘ turned out to be a bad way to understand chaos and in an area where predictions for more than 72 hours ahead can be wildly-off because of so much that is unknown or poorly understood . Its not in anyway ‘settled ‘ no matter how much ‘faith ‘ you have or how often you combine ‘heads you lose and tails I win’ and ‘find the lady ‘ in your professional practice. We used to just call it “WINTER”. CO2’s temperature influence is in the atmosphere, which has a tiny fraction of the thermal inertia of the ocean/atmospheric system. A comparison would be an elephant (the oceans) and a mouse (the atmosphere), and arguing that the mouse is dragging around the elephant! Nonsense! Mainstream climate science has no understanding of the ocean thermal cycles, which have been identified through observation over hundreds of years. Not only do they not understand them, they have no desire to even try! For 30 years, their entire focus and funding has been around increasing CO2, and the idea that a mouse can push around an elephant! The declining polar ice over the last 40 years is well correlated with the Atlantic multidecadal oscillation (AMO). From 1940 to 1973, the North Atlantic cooled by about 0.5 degrees C. From 1973 until 2008, the North Atlantic warmed about 0.6 C! Over the last 10 years, the North Atlantic has been cooling again, and appears to be moving towards another negative phase. All of this happened while CO2 was steadily increasing, apparently having no influence whatsoever on the powerful AMO cycle! If the AMO trend towards a cooler phase continues, Arctic sea ice will begin to expand once again over the next 5 to 10 years, destroying the only significant physical observation that the warmists had to support their ‘mouse-stronger-than-elephant’ theory’. No no, expanding Arctic sea ice will be a proof of global warming like it did a few years ago in the Antarctic. Yes, it will be “proof” that global warming has melted ice in Greenland, reducing salinity of the water, slowing the flow of the Gulf Current, and freezing the Pole. The alarmists already have that covered. I found this attempt to link the polar vortex to global warming this morning. It lectured me with this, AGAIN. And immediately followed with this. In other words are they not saying that climate is just a bunch of weather. Or climate is the sum of weather events divided by some number of weather events. My conclusion has to be that climate is weather and weather is climate. What is double speak. There were stories the other day suggesting that the SSW event from Dec/Jan was the cause of the cold outbreak. 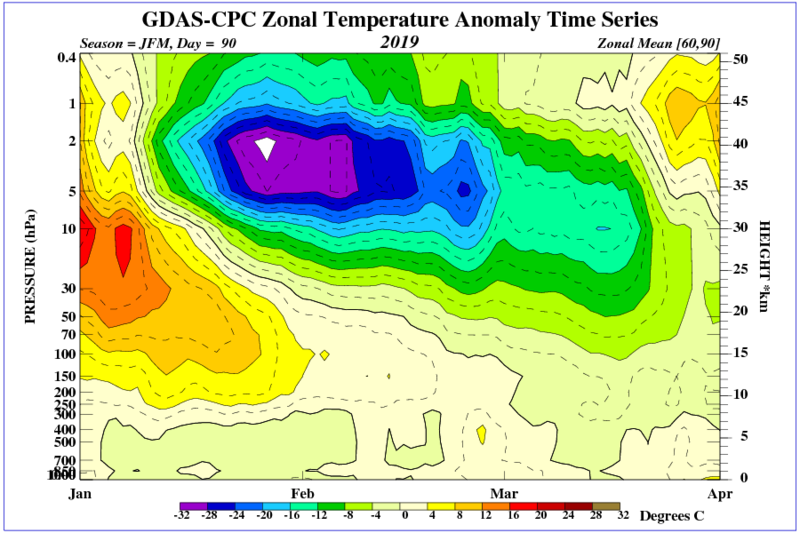 Then Borenstein was trying to say that the SSW was caused by some warming above Morrocco with no explanation how that could warm the stratosphere at 10 hPa above eastern Siberia which is where the SSW showed up. 6 appears to be the magic number in the last 100 years. Not since 1917 was a year that hit 6 or higher and then have the next year even higher. 2018 was about 7, so that predict this year (2019) will be less, maybe around 4 to 5. How much could these stations be affected by UHI? Expressing uncertainties about theories is the mark of good science and opposite the debate-has-ended Green New Deal push. Just eye-balling the graph, the estimated uncertainty in the slope is greater than the slope. The global warming people rarely show an uncertainty level, but we should be more responsible and plot that as well. Then we can state with confidence that the data show no statistically significant trend. I don’t think they will begin to improve their graphs by adding this important information, but we should. In hit and run advocacy and agenda-driven media tactics, it depends. The whole reason for the discussion is that accompanying every extreme weather event is prattle from alarmists that “These are exactly the type of extreme weather events we can expect more of in the future with global warming.” It can be a flood, rain, drought, storm, or anything. It’s tiring. So when the weather event is a shift in the polar winds to bring sub-zero weather to the US, Trump trolls the alarmists with a joke. Shifting warmth from one part of the globe to another part of the globe based on a diversion of a jet stream, or a change in a typical wind pattern is mere weather, and has nothing to do with long-term global climate patterns. We know it. The alarmists know it. Everyone knows it. But we argue about it anyway. Alarmists pretend that Trump isn’t making a joke and that this is what we believe. Instead of arguing against strawman arguments that they make up, they can now argue against a joke. It appears to me that the sun and the earth’s revolving and orbital properties explain most of things related to the climate change. Anyone one other thing i.e. CO2 that is used to explain everything else, in reality explais nothing at all. Skeptics are dismissed because they don’t have a theory that explains the observations. The reality is that the other side’s theory doesn’t explain the observations either. In fact, it is worse to say that you know when you obviously don’t, than it is to admit that do not have all the answers. The ladder is science. The former is politics and activism. Polar Vortex, I remember when they were just called a Arctic Air Inversion. But I guess Vortex sounds scarier. But how can an overheated arctic bring extreme cold air north. Only in the pseudo sciences. In physics, math, chemistry it only takes a single contrary example to falsify a theory. In point of fact, it is the falsification problem that separates true science from pseudo science. That and the need to add “science” to the name. Like The Peoples Democratic Republic. If you nèed to add Democratic to the name, you can be sure it is not a democracy. Political science, climate science. Non science, nonsense. Sounds the same because they are the same. If this winter was abnormally warm all the news services and all the scientists would be shouting that this proves global warming is real. But instead it is cold so they are shouting that this proves nothing. In point of fact it proves they are too embarrassed to admit they don’t really know what is going on. Many of them are inanely claiming that so far, 2019 has twice as many record highs as record lows. I am guessing they had to cherry pick some places and time periods. But in fact, every time cold air moves south, some warm air has to move north in equal quantity. Arctic outbreaks move cold air southward and then eastward to the ocean, warming it up. And warm air surges northward, where it’s heat is radiated off into space. Just like always, the result is a net poleward movement of heat from the tropics. About five years ago and earlier (old-timers here may recall) warmists said that insect damage to trees in the Rockies would worsen because AGW would ensure that no brutal cold snaps would kill them off. Falsified now, I guess. Yes, and see also: permanent drought, “our children won’t know what snow is”, etc. Karl Popper: A theory that explains everything, explains nothing. I know I know! Because it’s not due to global warming! Cause and effect are reversed in these pieces of fiction. Cold periods are associated with a much higher prevalence of plagues as peasants huddled together along with with favorite flea-infested rodents for warmth, for example. Those who speak of climate change and say the science is either simple or settled are displaying their shameful arrogance or ignorance. If they claim to be climate scientists, they are deceiving themselves and those who follow them. You can rightfully claim to be a biologist or mathematician, chemist or statistician, physicist or meteorologist, because you are someone who is very knowledgeable and an expert within this field. However, this cannot be the case with a “climate scientist” who has to depend on inputs from geography and meteorology, from mathematics and statistics, from physics and chemistry, as well as inputs from a number of other disciplines. Very few involved in climate science have PhDs in even two of these disciplines. And even among these, many display a woeful weakness in logical reasoning. Certainly, we need to make an efforts to better understand weather and climate. However, we can ill afford to waste considerable resources on trying to change the climate. We should focus rather on adapting to changes which innovative man has done throughout all of recorded history. Devil’s advocate here. With it generally accepted that we have polar amplification with warming, and even if it isn’t anthropo, this would predict that we have some decline in the coldness and severity of cold waves. In the blurb on Elizabeth Warrmin going for presidency, I argued the point that given polar amplification, and the NASA image of this outbreak covering much of the two land masses making up the NH, where is all this cold air coming from? Shouldn’t it under the circumstances be only -5°C by the time it spreads itself so broadly. If its -30C in Chicago, it must have been -60C in Alert, Nunavut! WUWT? One has to look carefully at just exactly what is being claimed when someone says “record cold”. Most often, it is a record for that date only, in that place only. But the way these stories are framed by the “If it bleeds, it leads” media, one might suppose it has never ever been this cold in these places or anywhere nearby, on any date, at any time. I have seen stories that headline with the words “record setting cold”, but then say in the article than it is the coldest in some place…since the last time it happened! When it was colder. How many credulous worrywarts stop and consider what the implication is, if Chicago just had the coldest January 30th in a hundred year? Do they think “It was colder 100 years ago on this date, so obviously this is not caused by 400 ppm of CO2”? Do they do some checking and find out it may have been as cold on January 25, or February 8, many times in that period? Looking at a graph of the means and extremes of temperature in any place on any date, and what is found is a roughly continuous curved line, with some notable peaks and valleys, indicating that a longer record will surely smooth out these peaks into a smoothly curving line. They routinely get stuff not even wrong, and in fact have no idea what they are reporting on or looking at when it comes to anything even slightly technical or factual. Pardon the layperson’s question, but does the decline in cold waves lend observational support to global warming? Depends on what you mean by “global warming”. If you mean its evidence that the world has been warming since the little ice age, well we already knew that, so additional observational evidence of that doesn’t change anything. If you mean it’s evidence that the world has been warming due to man’s emissions of CO2, then no it doesn’t support that because it says nothing about the attribution of cause (man vs nature). Okay – thanks. One of the reasons I ask is because of the so-called warming pause. I’m not familiar with the details of the data in the chart in this article, but it looks like the trend continues to decline even during the years of the pause. I’m wondering what would explain that continued trend. And without naming it, even before. In 1709 was no ordinary cold snap. Dawn broke the next morning on a continent that had frozen over from Italy to Scandinavia and from England to Russia, and would not warm up again for the next three months. Even Venice canals froze. Bundle up Anthony and Willis. polar vortex usually last about a month it might have triggered some other processes since cold ‘snap’ lasted about three months. 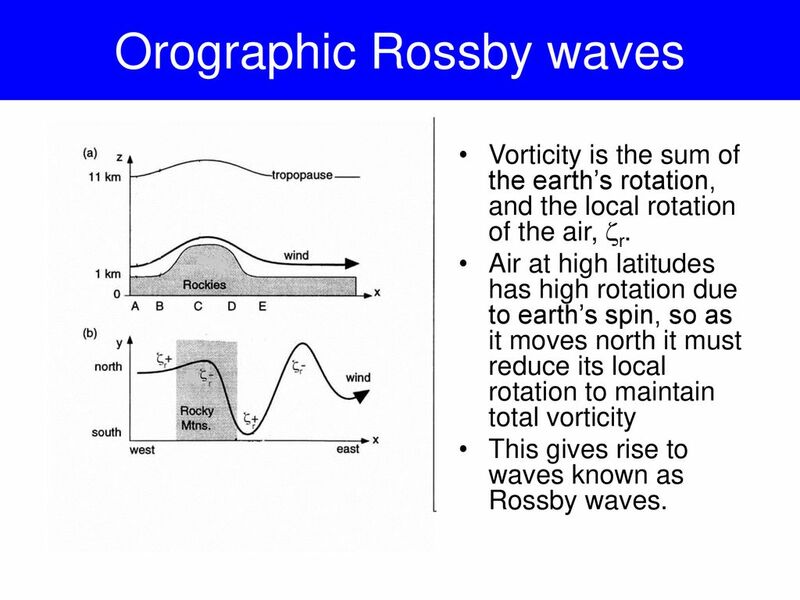 Isn’t weather one of the most complex multicriteria systems ? James Clark, an d many others say the same thing, its the Oceans stupid. Another way to consider this matter of what causes what, is t say that as the “Warmer ” say, its all about CO2, then lets go back to about 1750, the beginning of the Industrial revolution”, steam power had just been invented, a very crude form, .So back then there had to be very little so called “Man made CO2. So lets note, no models please, Hi. the weather patterns since then. “There had to be some connection with the rise of the CO2 in the vast atmosphere with the actual weather. Unless of course its all about the heat capacity of the vast Oceans. It is also easy to claim that we have two times five toes because the mathematics decadal base is 10. Anyone who claims the opposite is laughed at as fantasizing decadal denier. Living is easy for convinced 10toers. Funny, I can remember back in the 1980s when they blamed polar vortex excursions on global cooling. Re. the base of 10, what about way back in the days of the Babalonians, when the base was 60, from where we get the 60 minutes and seconds, plus the 360 degrees of the compass. What would the warmers do with such a wide base to play with ? Thank you. I’ve just read a global warming explanation for the polar vortex cooling by an Ethan Siegel and being skeptical I wondered if it had any basis in fact. This is fun. Dr. Christie posts a graph showing that the number of cold spells in the USA has been declining for at least 40 years and everybody accepts this as proof that global warming is false. If anyone else where to post that same graph as evidence of global warming everyone here would attack it as biased and that it was not proof of anything. This is fun . . . everybody accepts this as proof that global warming is false. Which part is fun, building the Strawman or burning him down? The post’s title, “If the Polar Vortex is due to Global Warming, Why are U.S. Cold Waves Decreasing?” declares the argument at-hand. Why make such inane comments? What many here are criticizing are the contradictory, ad hoc, made to order, ever shifting, goal post moving, logically inconsistent, and unsupported claims of the church of the warmista jackass panic-mongering intelligentsia. Of which you have just identified yourself as a card carrying member and knee-jerk disciple of. I think you are not really finding it to be any fun at all. But some people know better than to take themselves so seriously. Better to laugh at fools than to cry about their foolishness. I for one am laughing, not with you, but at you. Re. Dr. Christie and others regarding global cooling. If it should occur the Greens will claim the credit for it, saying that it just proves that their policies are correct, and that we should continue to do what they tell is. To “Save the Planet”Hi. I’d fit a sinusoid to that chart, not a straight line. Gotta love a theory that is effectively unfalsifiable. The ice sheets can grow, the glaciers can advance, and the alarmists will point to that as proof that we are responsible somehow. Nothing can disprove human-induced climate change. Not even the inevitable end of the current interglacial. Is there a proxy – or historical record – to indicate polar vortexes have been happening over a longer time scale? Is this a trick question, Bill? The circum-polar vortex is something which can be read about in any textbook in physical geography, meteorology, climatology, or atmospheric physics going back many decades. 1950s at least. Using the phrase “polar vortex” to describe the intrusion of cold air into the US in Winter is what is new. The phenomenon itself has been going on for as long as there has been weather. I posted just a couple of easily found historical accountings of polar air intrusions into the state of Florida, going back to the time of the American Revolution. And you can be quite certain that if it is freezing cold in South Florida, it is very cold indeed in states far to the north that the air had to move through before arriving here. And it was warming the whole way down. The sun angle is now the same as it was in early November. In six weeks it will be the same as it was in September, and the sun will rise on the north pole for the first time in six months. But it will still be snowing in the northern tier of states, and the date of average last frost in places like Philadelphia is not until mid-May. By then, SW Florida will be hot as hell, and not see another day below 85 degrees until October. Do you really think anything involving the weather is new? If so, that is the problem: People who know nothing about such things and have zero historical perspective or knowledge of weather events, nonetheless feel qualified to make sweeping pronouncements about the what the weather will be doing in the year 2100. Due to a 15% reduction in sea ice in the past 40 years? According to George Kukla as reported in the Times in 1974, global cooling increased Arctic sea ice 12% in 4 years causing more severe polar vortexes. Sea ice has nothing to do with outbreaks of polar air southwards into the US. It has happened when ice is high and when ice is low and everywhere in between. Sea ice is higher now than it was 10-15 years ago, when they claimed global warming meant no more snow. Which they only said because of some not-so-severe Winters over a period of several years. It is thought that there have been at least 30 El Niño events since 1900, with the 1982–83, 1997–98 and 2014–16 events among the strongest on record..
They’re spaced about the same. Is there a millennial record for polar vortices? Because of global warming. See? It explains everything. It must be clearly emphasized that sudden warming in the startosphere occurred at the end of December and its effects reached the surface only at the end of January. The graphic shows how the stratospheric polar vortex was broken in January. 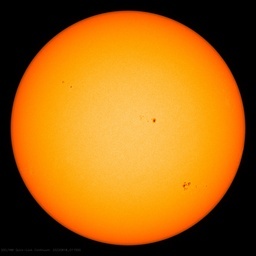 I remind you that solar activity is currently minimal. 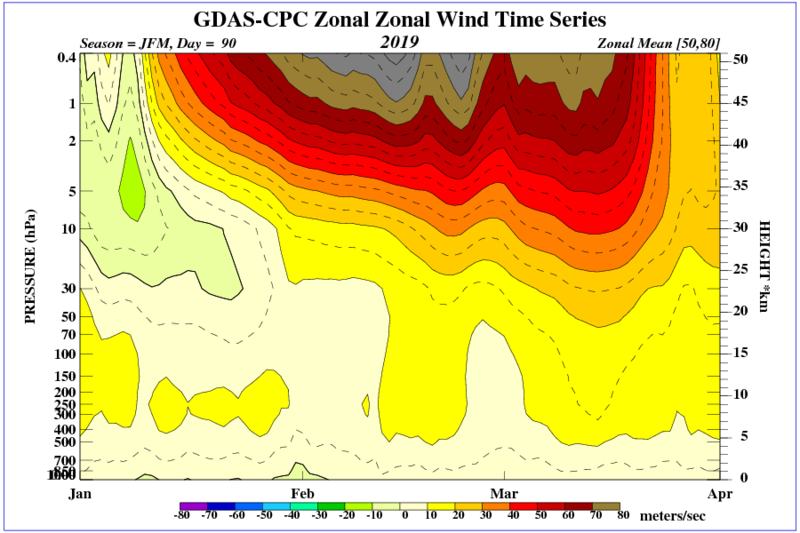 The graphics show a huge anomaly of zone winds in the stratosphere. A negative wind means a change in the wind direction in the polar vortex to the opposite in the middle of winter! The following graphic shows the temperature anomalies in the stratosphere from the beginning of the year. Currently, the temperature in the stratosphere returns to average. The ozone wave in the stratosphere is now moving over the Northwest Atlantic. Grim stories like this one provide perspective on what has occurred recently. This year, Florida has so far been spared any major cold snaps. “By 2pm., the San Juan was in an uproar. Prices had dropped to ‘no sale’ commission merchants were frantically trying to get out of options, and heated debates and fistfights started in the lobby. About 9 that night, a fine looking grey-haired man in a black frock coat and Stetson hat walked up the street in front of the hotel and looked at the thermometer, groaned, ‘Oh, my God!’ and shot himself through the head. Just as an aside, the reason Florida has had no major intrusion of the polar air mass so far this year is very simple: The cold air is almost always propelled as far south as Florida by large coastal storms…nor’easters. The kind that form off the southeast coast, move northward and “bomb out” offshore of the mid-Atlantic and northeastern states. Sometimes they form in the Gulf and move across the peninsula and then up the coast. From December through February, if there is a huge coastal storm at the same time as Arctic air is being push south, it will get the extra kick it needs to keep on going far enough to freeze central and south Florida. Back in the 1980s and 1990s, the phraseology most often heard by forecasters to describe what was happening was that a trough of low pressure was causing the jet stream to “dig” southward, and that this digging trough induced a low to form somewhere in the Gulf or Atlantic and move up the coast. Arctic outbreaks, polar intrusions, dip in the jet stream, digging trough of low pressure in the upper atmosphere…all described the same thing as what is now being called “the polar vortex”. Those previous ones were descriptive, and the more recent one, just dumb. I like to go into digitized newspapers to find items of historical significance. There must have been a HUGE vortex then. Interestingly, iffen we have ourselves a gander at the by-now highly adjustamacated temperature history graphs, we can see that according to the people who have “fixed” all of the mistakes people made back then, when they were reading thermometers, and writing down what they said, when of course they had no idea how to do so…well according to these now “fixed temperature records, that period of time mentioned in this article, in which people could see with their own eyes that Arctic ice was melting and was far lees extensive than it had been in years and decades prior, was actually the COLDEST period of time in the last hundred plus years, and it has been warming (more or less) steadily ever since. Of course this by itself proves that the adjustments are bogus, and do not “fix” anything at all, but instead distort the historical record in ways that make it useless for any purpose at all, unless that purpose is to tells lies and spread global warming propaganda. We know that in the 1970s Arctic sea ice was expanding rapidly, such that 1980 or so was a recent maximum in ice extent. And yet in the time series graphs of global temperatures, it is clearly shown that the 1970s were far warmer than the 1920s. All claims of unprecedented events can be proven to be anything but unprecedented. In reality, there is nothing at all that is even unusual, except that a wave of mass hysteria and psychosis is spreading throughout some segments of a startlingly miseducated and highly gullible populace.